This unique piece of digitally designed and manufactured craftwork was selected by Tanya Harrod for the European touring exhibition ‘Languages’. The piece was chosen as one of two pieces of new craftwork to represent the UK. This research project investigated how online digital Geographic Information System (GIS) data from the Edina Digimap service could be used to create unique 3D objects with terrain influenced elements. The project also explored methods for the 4 axis CNC machining of complex 3D forms from single pieces of material. In addition a series of rapid prototype test pieces were created to help establish the most appropriate way to mill the objects. 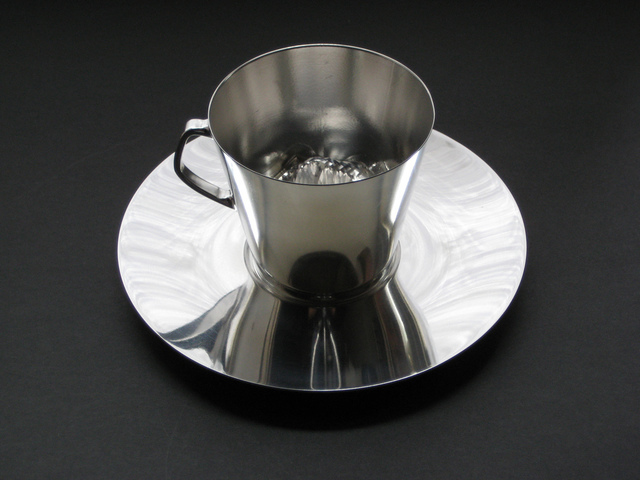 ‘Terrain Cup’ is one of the first 4 axis CNC produced pieces of craft to be made, its production required the development of new methods for creating user defined CNC toolpaths in order to machine the design from one solid piece of aluminium. These methods allowed the author to have complete control over the movement of the cutting tool rather than using presets within the software.